IF however there were some rebels who never wanted to submit (for there are some in many Empires), and who, from contrariness, still preferred to renounce all coiffure, and get rid of all panaches, from where I permit removing them, than to adopt the Hat which I spoke of in the Ist Plate; as my empire is sweet, easy, and that I only want to command subjects with good will, it may be permitted to them, conforming with the IInd Pl., in making a coiffure en cheveux, and in only wearing as a parure on the head two ribbon bows, of which one is attached in the back, over the toque or chignon comb, and the other on the front of the head, three or four inches long. This will be, if I can say it, my little uniform. We have received these two orders, and we have brought them back. Our Subscribers may sport one or the other. 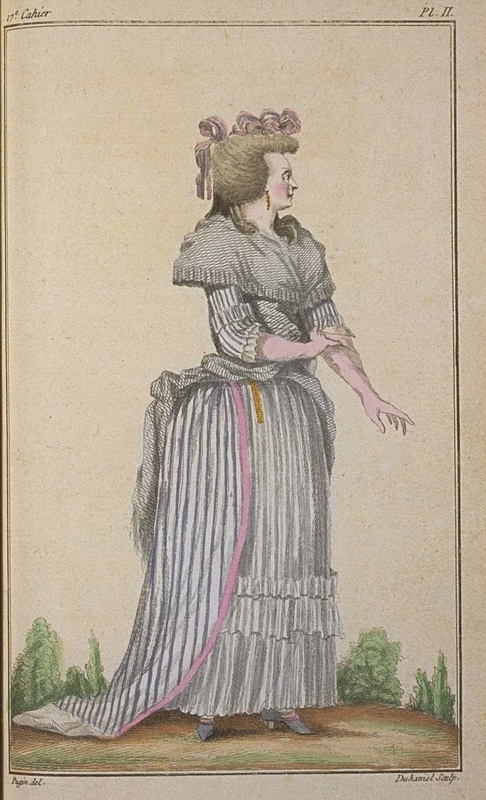 The Woman represented in this Plate, is dressed in a Gown of gauze with white satin stripes, and soft lilac stripes. This Gown, made à la Turque, is bordered with a ribbon of soft pink. 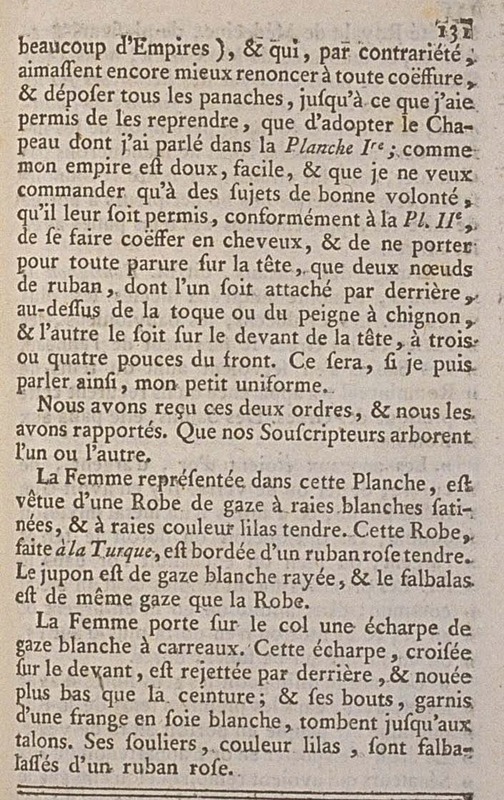 The petticoat is of striped white gauze, and the flounce is of the same gauze as the Gown. The Woman wears on her neck a scarf of checked white gauze. This scarf, crossed in the front, is thrown back behind, and knotted below the waist; and its ends, trimmed with white silk fringe, fall to her heels. Her shoes, lilac color, are flounced with a pink ribbon.